Tightest Security In Years At New Year's Celebrations In New York And Las Vegas : The Two-Way Snipers. Specially trained dogs. Multiple layers of security screening. Detectives in hotels. After recent attacks, New York and Las Vegas are seeing beefed up security this year. 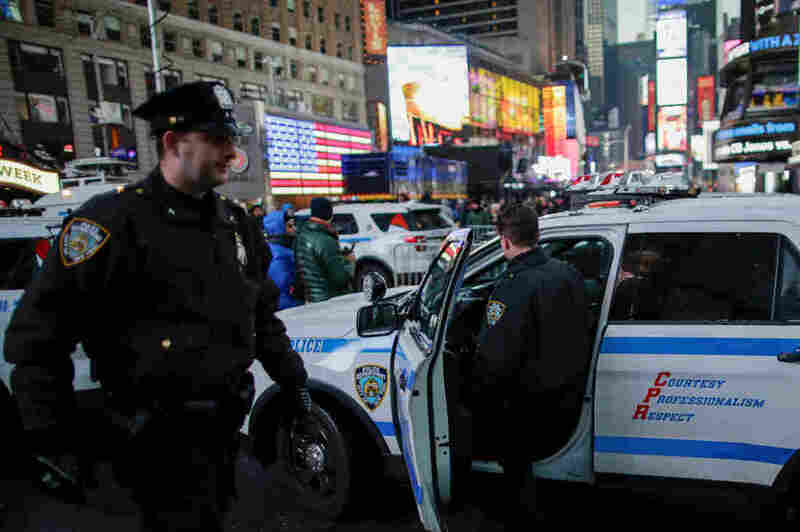 New York Police Department officers prepare for New Year's Eve celebrations in Manhattan's Times Square in New York. New Year's Eve celebrations are just hours away. And police departments around the country have been preparing for months for the celebrations. New York and Las Vegas, the sites of recent attacks, will see more security than they have in years. It's been three months since an attacker shot dead 58 people from a hotel window in Las Vegas. "I understand that some people may be anxious in light of what happened on 1 October," Clark County Commissioner Steve Sisolak told reporters. But he says the precautions "will bring an unprecedented level of security to the festivities." "In previous years we had spotters in elevated position throughout the downtown area and the strip corridor," said Las Vegas's sheriff, Joe Lombardo. "This year, along with those spotters, they'll be accompanied by snipers." There will be more than 300 National Guard troops, double the usual number. Some 15,000 police are deployed over three days. A federal coordination team will be on the ground to respond to any incidents. This is the only New Year's Eve celebration in the U.S. that federal officials designated at the highest risk level. On New Year's Day, federal officials have also designated the Tournament of Roses Parade and Rose Bowl football game in Pasadena, Calif., with its highest risk designation, like Las Vegas. There's a federal coordination team in place there, too. Across the country, New York is preparing to welcome some 2 million people to its celebrations. It's going to be chilly in Times Square – lows tonight are at just 8 degrees. "There are no credible and specific threats against New York City at this point in time, and no credible and specific threats against the New Year's Eve celebrations," said Mayor Bill de Blasio at a recent press conference. NYPD Commissioner James O'Neill says the party, which features performances from Neil Diamond and Mariah Carey, is going to have its tightest security in years. "The bottom line is this: there's much the public will see, and there's much the public will not see." In that area, they're closing and sealing 125 parking parking garages and deploying uniformed detectives to every hotel. They're going to be using dogs that are vapor wake, meaning they're better at sniffing out explosives in moving crowds. And compared to previous years, they'll have more snipers, more heavy weapons teams and bomb squad personnel, and more police on the ground. Former commissioner Bill Bratton told NPR that about 6,000 police officers will be involved in securing New Year's Eve events in New York, in addition to the police on their normal patrols. There are also going to be some 1,000 surveillance cameras in the area, said James Waters of the department's counterterrorism bureau. He explained what party-goers will see as they enter the heavily guarded Times Square perimeter, marked by cement blocks and city vehicles. They'll pass a vapor wake dog. Then, "they'll go through a magnetometer or they will be wanded for weapons. Then at some point they'll come through a table where they'll have their bags inspected."